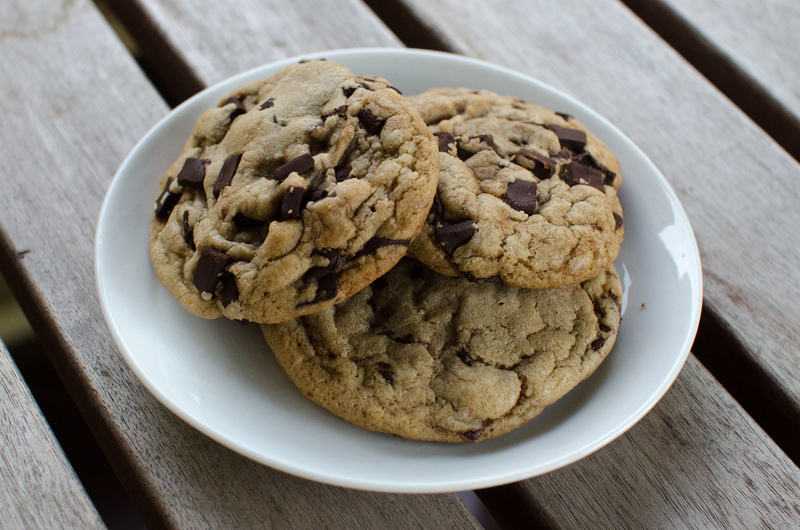 I'd be lying if I didn't say chocolate chip cookies. This is my preferred recipe. Notice the abundance of chocolate. 1. Adjust oven rack to middle position and heat oven to 375 degrees. Line 2 large baking sheets with parchment paper. 2. Whisk flour and baking soda together in medium bowl; set aside. 3. Heat 10 tablespoons butter in a light colored skillet over medium-high heat until melted, about 2 minutes. Continue cooking, swirling pan constantly until butter is dark golden brown and has nutty aroma, 1 to 3 minutes. Keep an eye on it. Don't be afraid to push it to just about the point of burning. Remove skillet from heat and, using heatproof spatula, transfer browned butter to large heatproof bowl. Stir remaining 4 tablespoons butter into hot butter until completely melted. 4. Add both sugars, salt and vanilla to bowl with butter and whisk until fully incorporated. Add egg and yolk and whisk until mixture is smooth with no sugar lumps remaining, about 30 seconds. Let mixture stand for 3 minutes, then whisk for 30 seconds. Repeat process of resting and whisking 2 more times until mixture is thick, smooth and shiny. Using rubber spatula or wooden spoon, stir in flour mixture until just combined, about 1 minute. Stir in chocolate chips, giving dough final stir to ensure no flour pockets remain. If the dough looks too fluid, give it time to rest and firm up. 5. Divide dough into 16 portions, each about 3 tablespoons (or use a #24 cookie scoop). Arrange 2 inches apart on prepared baking sheets, 8 dough balls per sheet. 6. Bake cookies 1 tray at a time until cookies are golden brown and still puffy, and edges have begun to set but centers are still soft, 10-14 minutes, rotating baking sheet halfway through baking. Transfer baking sheet to wire rack; cool cookies completely before serving. These are even better the second day. This is my archive of baking events. October 23, 2018: Fudge Ball Cupcakes from Cupcakes! These are my references and books. Thanks for stopping by. Bake on.